An internet protocol camera, or IP camera, is used for a variety of reasons with one of the most common being to enhance the security of your home. Acting as a surveillance device, an IP camera can offer adequate protection against theft and property damage, not to mention provide you with a clear image all year round. IP cameras are a fantastic way to safeguard your property, not to forget your family. If you are thinking of investing in one of these devices, but you’re unsure of exactly what they can offer you, read on. In this article we will be taking you through a few of the reasons why these cameras excel, and why they are ideal for your home or business. Before we begin though, let’s take a moment to refresh our minds. So, what exactly is an IP camera? Well, an internet protocol camera is a video device that can record data and exchange it using the internet. 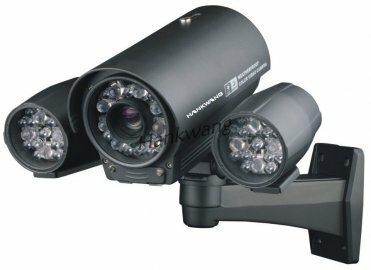 There are usually two types that you can buy for surveillance for your home or business. These are centralised and decentralised IP cameras. Centralised cameras need to be hooked up to a Network Video Recorder in order to be able to operate alarm and recording settings. Decentralised, on the other hand, do not require this network and any data recorded by the device can be instantly saved in the camera’s storage device, such as an SD card. Now we’ve taken a look at two different types of IP cameras, let’s see what they can offer homeowners and businesses. First and foremost, IP cameras can offer peace of mind to business and home owners who have experienced theft or property damage in the past, or those who worry about these situations. Having peace of mind will also help a business owner to focus on improving their company without constant concern that the property is at risk. For homeowners, being able to rest in the knowledge that you are well protected and secure can make a world of difference, especially for those who live in areas where they feel unsafe. While you have the option to invest in a few video cameras, unless you get a top of the range model, they may not promise the quality you hoped for. IP cameras on the other hand are not only cheap and cheerful; they guarantee first-rate quality, making them a very cost-efficient alternative too. Our final benefit is that IP cameras are incredibly easy to install and use. Also, there are wireless cameras available on today’s market, ensuring optimal ease of use and reducing the amount of cables running through and across your property. These are just three benefits of using IP cameras for security purposes. If you are looking to purchase an IP camera for your home or business, please feel free to look through our range. Alternatively, for more information get in touch today through our website. We look forward to hearing from you.